Our Website Care Plan includes the following, which is performed on a weekly basis to keep your website protected and up-to-date. Updates: We update your website every week. 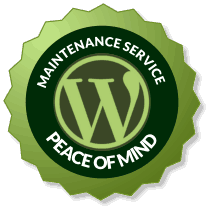 This includes WordPress core files, theme files, and any plugins that were used to create your website. Backups: Your entire website is backed up weekly before each update is preformed. These backups are stored securely off-site on Amazon's Cloud storage. Security: Security measures are put in place to monitor unauthorized access. Software: Includes annual subscription payments for 3rd party software. Up-time Monitoring: We monitor your website 24/7 to ensure your site is always online. Broken Links Scan: Your site will be scanned for broken links which will be fixed or reported. Tracking and Reporting: Visitor statistics reports are also available. Priority Service: Your requests will be given top priority. This is a monthly service plan. You will be charged each month to keep your website protected. You can cancel at any time.